When you already experienced Prague, you pretty much almost see everything. Your standard of expectation will raise involuntary. It's like you already felt the climax..then you won't get easily satisfied with other cities. 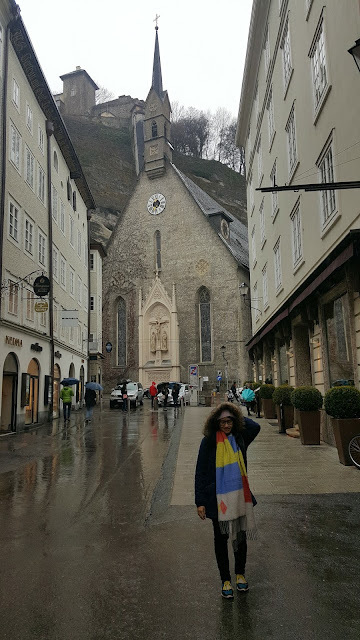 Our next trip brought us to the city of Salzburg, just located in the border of Germany and Austria, Salzburg listed as UNESCO World Heritage Site in 1997. Salzburg city architectures are dominated with Baroque and Romanesque style with Alps mountains as a background. We arrived at Salzburg from Prague to Munchen (via Bus) and connecting to train to Salzburg. Along Munchen to Salzburg, we can see the scenic view of Swiss Alps and I assure you it's worth to enjoy the view instead of sleeping. We spent for almost 7 hours to reach Salzburg. 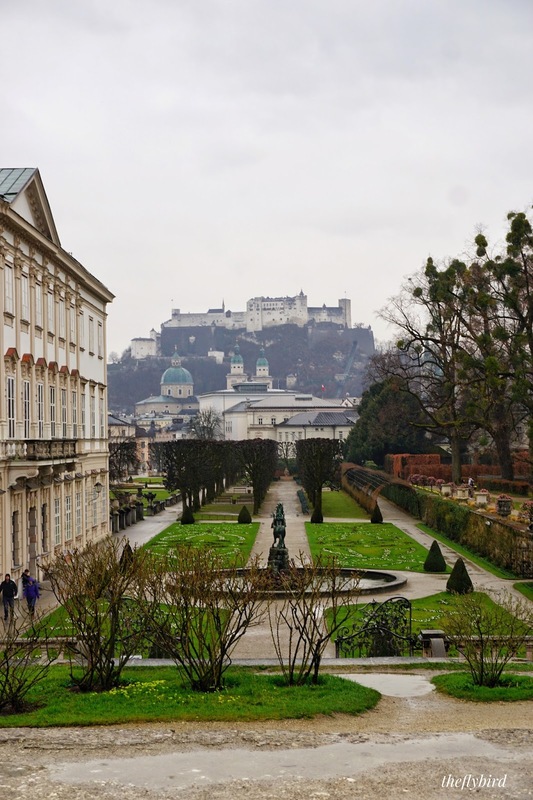 Same like the other cities, we only have one full day to visit attractions in Salzburg. 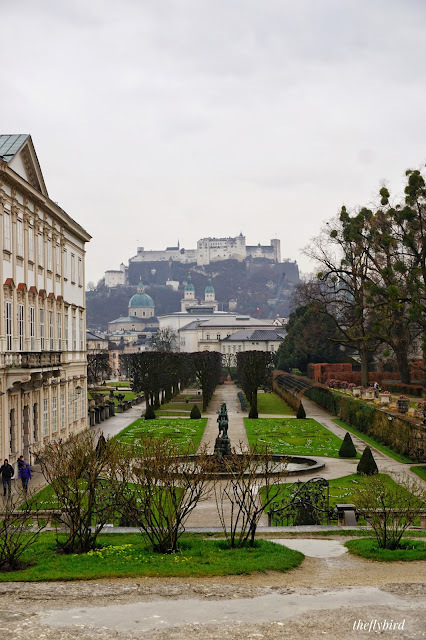 Initially, we went to spend time two full days in Salzburg and surrounding (Hallstaat). But our previous trip, Prague worth longer time therefore we late to book train to Salzburg. Leaving arround 9 o'clock in the morning, the rain poured and the wind blew so hard. The city downtown is quite, there were not much traffic. 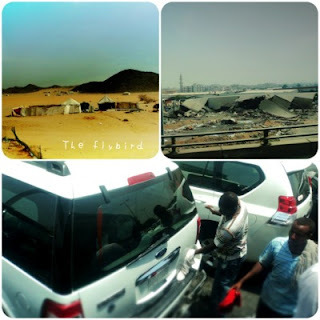 We don'w know, may be it was because of weekend or rainy day. Either way, we walked on the main street and noticed many Halal Food Restaurants. In Salzburg-or Austria in general, there are many Turks Immigrant living in Austria, not excluded In Salzburg. In fact, Turkish people were recruited to Austria as Gastarbeiter (guest workers) for the construction and export industries following an agreement with the Turkish government in 1964. Though the agreement was already ended, Turks still the leading single immigrant group in Austria. Our First destination is Mirabell Schloss or Mirabell Place and Gardens. Mirabell Gardens were completely redesigned under archbishop Johann Ernst von Thun in 1690. The underlying geometric form, which is typical for the Baroque, is still clearly recognizable. The visual orientation towards the cathedral and fortress adds to the grandeur of the gardens. In spring, Mirabell Garden will absolutely astonishing with its roses garden and fountains. Since we arrived there in March, there were only few flower blossoming and the leaves is nowhere to see. Mirabell Garden also used as the shooting place of the one and only The Sound of Music. One of the reason my visit in Salzburg is The Sound of Music. There is The Sound of Music Tour Bus where we can explore major attractions that used as shooting place this movie. But we only have one full day and rainny, we decided to do our own itinerary. We continue to walk south and found a little plaza where Mozart Wohnhause lay in there. Accross the hause, there is a sculpture called Caldera. Also, on the east side of plaza, there is beautiful baroque church with turquoise tower called Dreifaltigkeitskirche. Mozart Wohnhaus or Mozart Residence is Museum of Mozart where he lived there until early 1781, when he left the city for good to live in Vienna. The Museum keeps the original documents and portraits document the history of the house, of Mozart's compositions during his Salzburg years, and of the social environment of the Mozart family. Special attractions include Mozart's original fortepiano and the famous family portrait in the ‘Dance-Master's Salon’. There are also rooms with specific topics such as the women in Mozart's life, espesially his sister Nannerl. As far I know, there are three Mozart Museum that potrayed years when Mozart live in there. The other Museum, just lay accross the Salzach River, 500 meters from Mozart Wohnhause, The Mozart Geburthaus or Mozart Birthplace. Located in the famous Geitredegasse street, house number 9, Mozart Geburthause is main attractions for tourist especially avid fans of classical music. It was actually the International Mozarteum Foundation which first opened a museum in the house back in 1880. Each museum admission is EUR 11 for adult, but we can buy combo tickets (Birth place and residence) and save EUR 4. Or for Salzburg card holder will be free of charge. Once in Geitredegasse, don't forget to take a peek at the stores line in there. Major Europe fashion franchise open their stores in there and give more sale items other than in Asia (yeah absolutely). Name Zara, H&M and Mango which come slightly cheaper than in my home country. Also, there are many cafes and restos lay in there. Since it was rainny and we quite sick of pasta and pizza, we browse asian resto near Geitredegasse. There is small resto (or shop since it is very small) near the alley connect Geitredegasse to Greisgasse called Kim 168 which serve Asian food with cheap price and delicious taste.We ate fried noodle and tom yum soup and really not dissappointed! The owner cook and serve the food by hisself! After our belly is full and happy, we continue to walk at Geitredegasse and toward to north and saw beautiful church at the end of street. St. Blaise Church built in 1330 and definitely one of Gothic architecture masterpiece. Continue to north, our next destination is Monschberg Lift or The MönchsbergAufzug. Located in the one of five mountain in Salzburg, Monchsberg is look alike rock hill in which adjacent lift, restaurant, modern museum and small amount of forest. At the entrance, we can see beautiful gate just like in fairy tale. Ascending or descending via lift costs passanger each EUR 2.30, while both cost EUR 3.60 (save EUR1.00). I remind you, if your schedule is tight please buy two way ticket that will save your energy and time. Monchsberg lift brings us to a terrace with most stunning panorama in Salzburg. 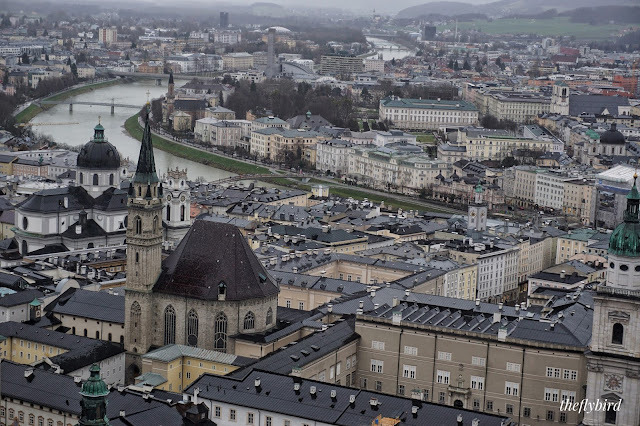 We can see the highest point in Salzburg, Salzburg castle and the most important landscape, Kollegienkirche or College Church with (again) baroque style. Just behind the College Church there is view one of the oldest church in Salzburg, Franciscan Church-which originally built in gothic then later redesigned to Baroque style. When we arrived at the terrace, it was quite. Only me and husband in there due to the hard rain. The City was covered in mists and we freeze under 6 degree celcius (in March!). We intendly didn't explore Monchsberg mountain because the wind blew so hard. We just descending and continue to explore the old city. There are many of beautiful and well maintained buildings in old city. I can't mention all in here, just follow the maze or get lost without map to explore historical building which built since gothic era. There is Salzburg Cathedral, Salzburg museum, Universitatkirsche not forget to mention one of the must-visit Resindenzplatz-a large stately square just in the heart of historic center of old town. Of course it is forbidden to miss-visit Mozartplatz, Mozart Statue. The Residenzplatz were built under Prince-Archbishop Wolf Dietrich von Raitenau: Residence Square with its richly decorated baroque fountain is probably the largest and most beautiful square. The Residence Fountain, too bad when we were in there is undermaintained. It felt like visiting Singapore miss out the Merlion statue, and sadder because the fountain is almost 500 years old. We continue to walk (still under the rain) to the Festungsgasse. The Festungsbahn is a funicular railway providing public access to the Hohensalzburg Castle or Salzburg Castle. It links the castle with Festungsgasse, under the north side of the castle walls. The Festungsbahn opened in 1892. Even it is old, but calm down the funicular is modern and safe! I actually forgot how much the fare for Festungbahn. I guess it is EUR 12 plus admission to enter museum in the castle. It costs quite deep, but it is a must do activity in Salzburg. I mean unless you want to hike Salzburg Castle by foot, then you can skip this experience. 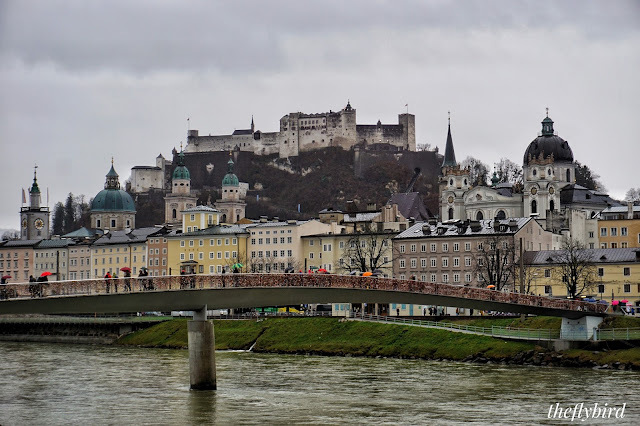 The creme de la creme of Salaburg, of course Salzburg Castle or Hohensalzburg Fortress. Built in 1077, the castle is open to public all year arround since 1892. The original purpose of the fortress was to protect the principality and the archbishops from hostile attacks. In all of these years, it has never been captured by foreign troops. The castle is 150 meters wide and 250 meters long, and the oldest part is over 900 years old.Though the complex is smaller than Prague Castle yet it gave different sense to the visitors. While in Prague we see cobblestone street everywhere, we see sand and mud in Salzburg. Salzburg give sense more simplicity (in a very good manner) than Prague in which offered grand and lavish feels. 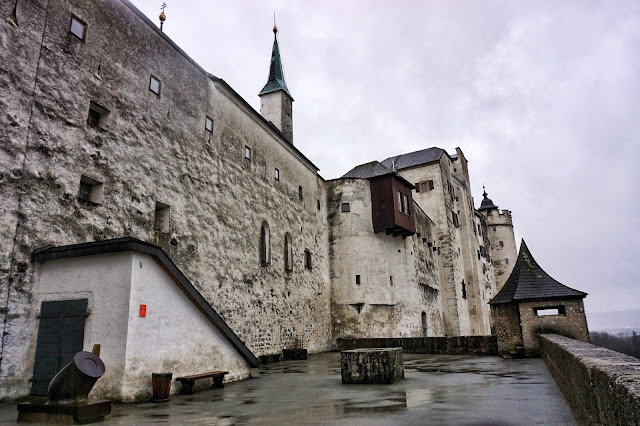 We explore almost every room in the Salzburg castle and my most favorite part of course the breathtaking view at the castle terrace. Of course we amazed with Marionette museums inside (and get scared also), or feel the intensity of cannon thru the window and mezmerised to read the chorinicles at the museum inside. 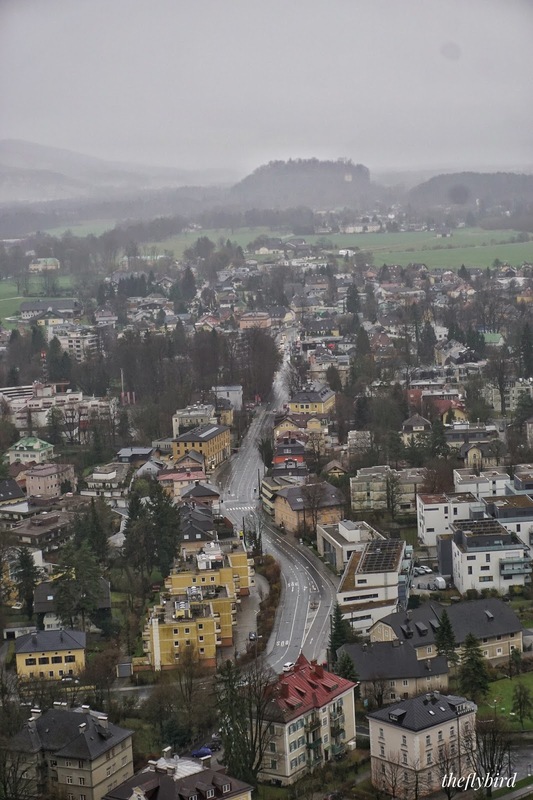 Still my favorite is gazing (under the rain) thru the Salzburg view at 360 degree. 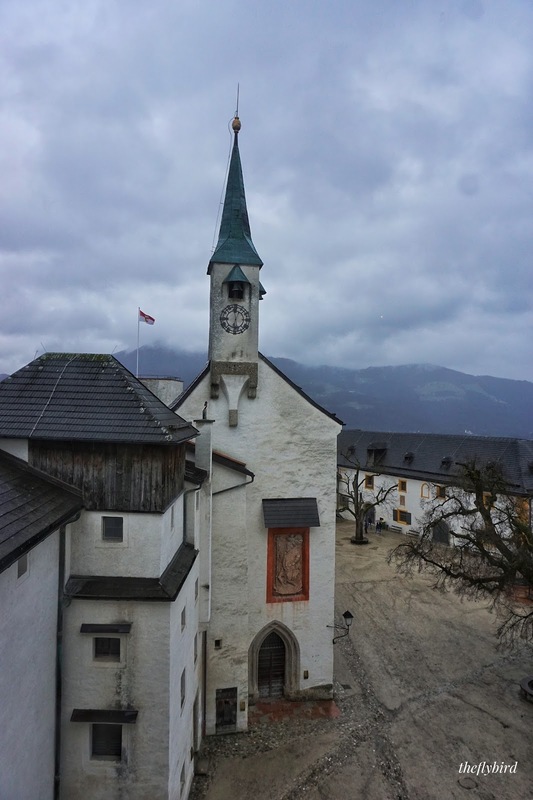 After exploring the castle, we descending via funicular and then walk back to the old city and continue to walk at the Salzach River border. Salzach River is one of the cleanest I ever seen. The river colored green under the rain and we can see the riverbed. We walk about 1.5 kilometers back to the hotel and enjoy the fresh breeze of Salzburg. Along the way, we can see beautiful buildings under the hills just like in the fairytale. While at right side, we can feel the resident houses calm and serene. Salzburg is what i called-Chillin' City. Everything seems walk slower and we can stop walking to enjoy something. I mean really enjoy something! Salzburg also less crowded that made me wonder that city is like holiday-or retirement city. Yet don't underestimate its public transport system. Salzburg boasts an environmentally-friendly bus system that includes electric trolleybuses running on overhead powerlines. That's why we can see cable-almost everywhere above the street for bus powerlines. Plus, people drive here-not calm as the city's mood. Several time, we were afraid to got strucked by a bus or just a bike when we crossed the street. What I love the most from Salzburg, aside for beautiful sites, is the easyness to get asian or halal foods. Yeah, I am very modest like that because when we reached Salzburg, we start to miss our homefood. If you asked me which one better Prague or Salzburg, well to be honest it is like comparing salmon and beef which both are my favorite dish. So, don't asking though! It is really giving you different atmosphere. I guarantee it! Then see you on my next post!